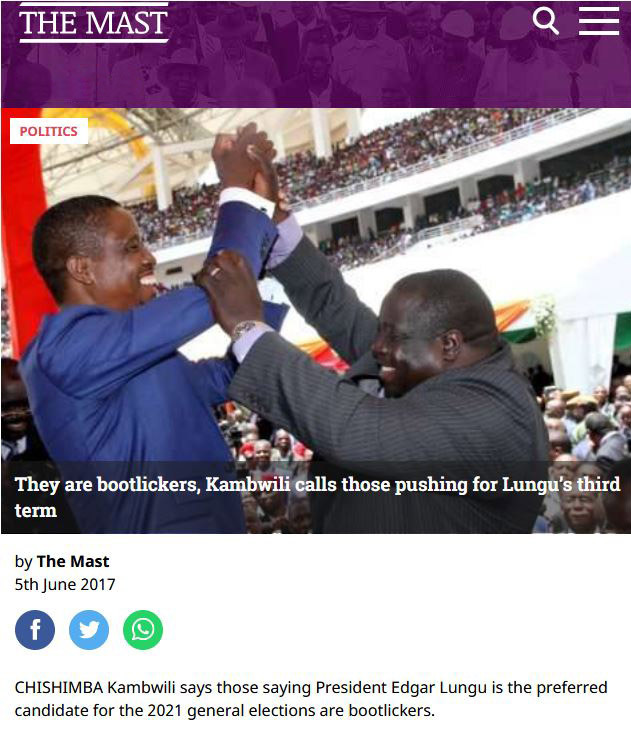 The Mast, Zambian Watchdog, Zambian Intelligence News, The Citizen – four Zambian news outlets having four things in common: they are controlled by President Lungu’s long-time enemies; they are vitriolic against Edgar Lungu and the Patriotic Front; they recently became Chishimba Kambwili’s supporters; and they took part in Kambwili’s attack on Lungu over the FQM settlement with ZCCM. 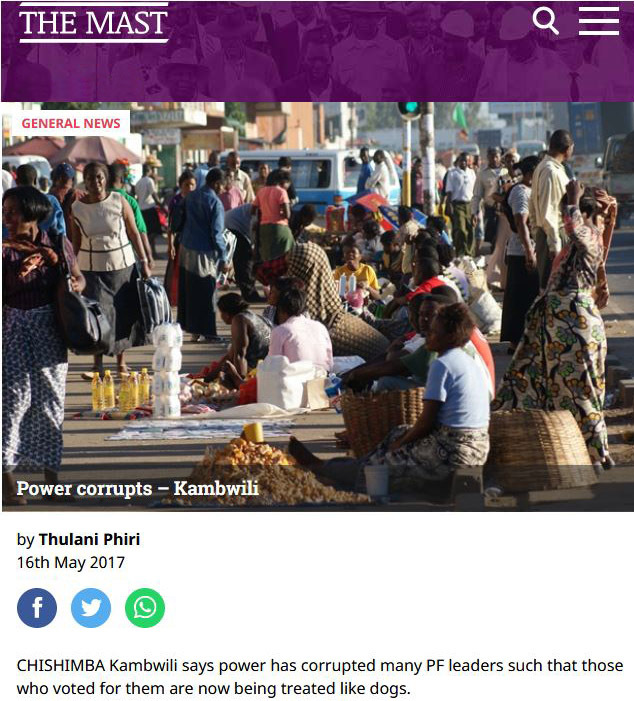 They used to call Chishimba Kambwili “corrupt”, “abusive”, “tribal”, “violent” and “incompetent”. 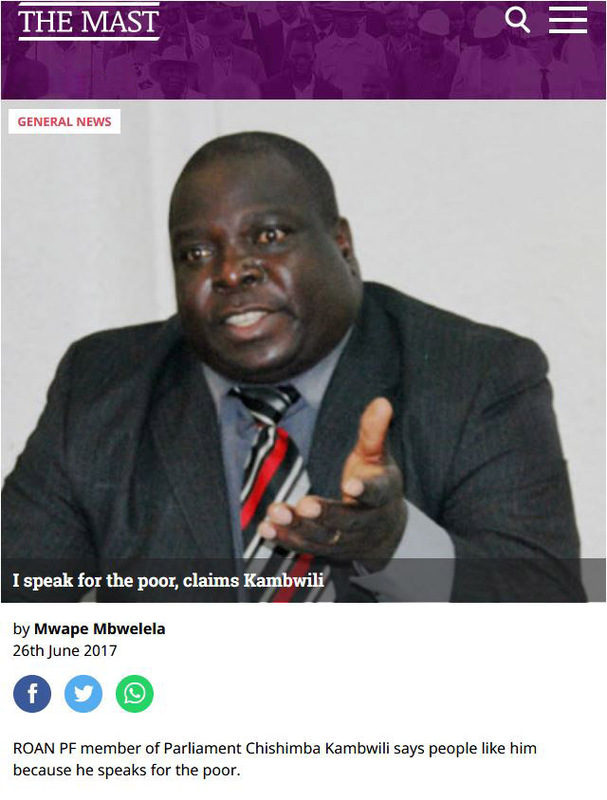 Until recently, Kambwili was the target of Fred M’membe and The Post’s negative campaigns. 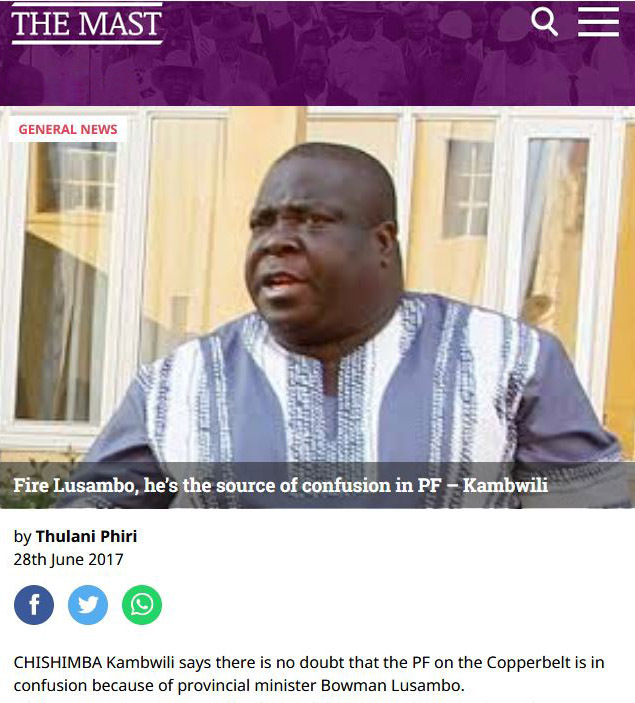 Kambwili, on his part, used to discribe M’membe’s newspaper as “a stupid tabloid”, and to accuse The Post’s journalists of “peddling lies against those they hate”. Now the days of war are gone. Every few days, M’membe’s new tabloid, The Mast, runs a favourable article on Kambwili. The former PF minister has become the cartel’s darling. 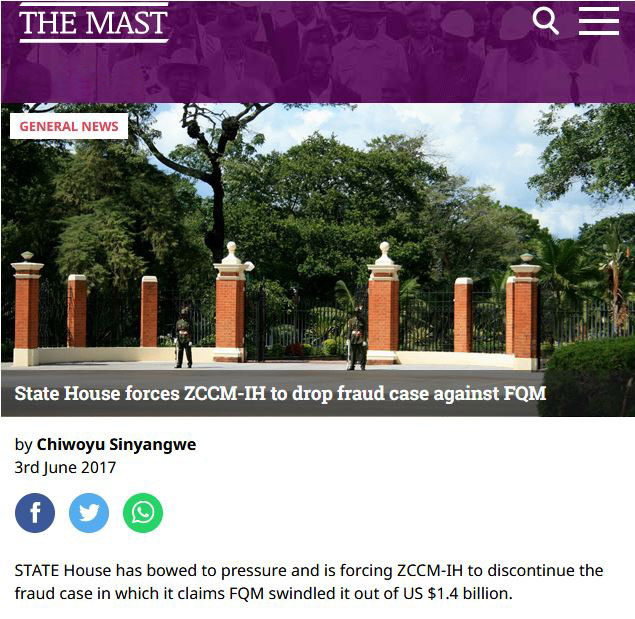 And, as revealed by OSI, it was The Mast that received a secret letter critiquing the potential settlement between ZCCM and FQM to The Mast. 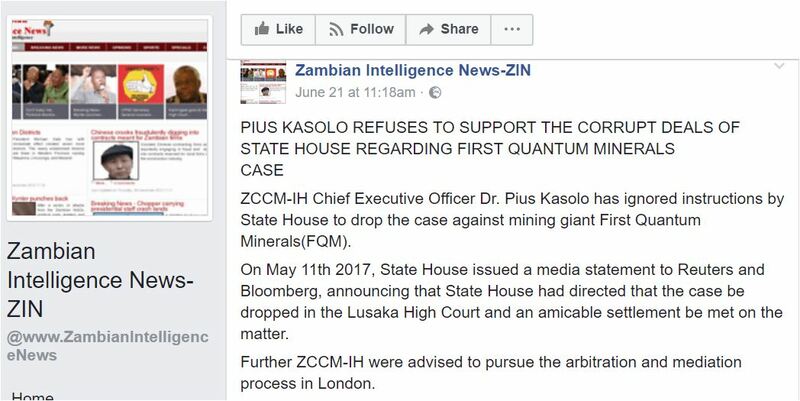 The letter was delivered to the newspaper by Chishimba Kambwili’s courier, Kelvin Chishimba (http://www.opensourceinvestigations.com/). It was given to Mutinta M’membe, Editor in Chief of The Mast and wife of Fred M’membe. 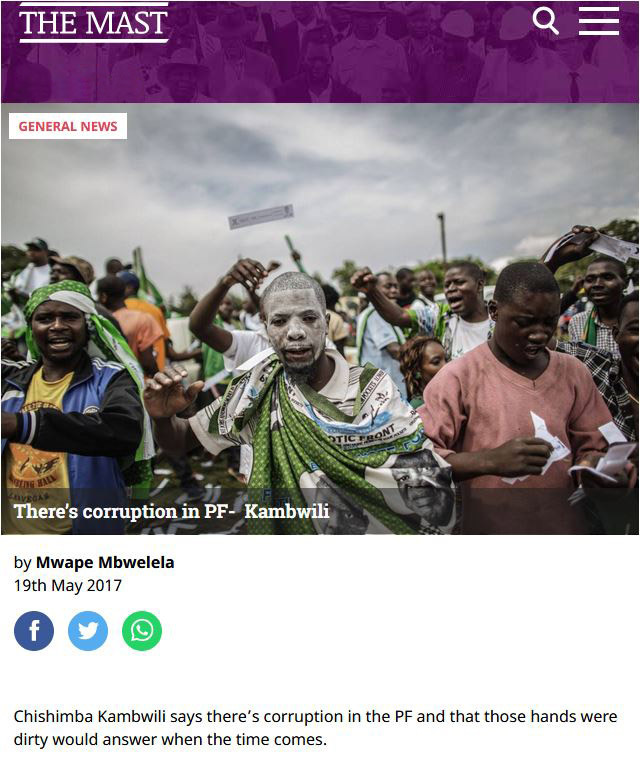 Fred M’membe is the former owner and editor of The Post and the leader of the so-called Cartel, a powerful group of businessmen and politicians sharing an anti-Lungu agenda. 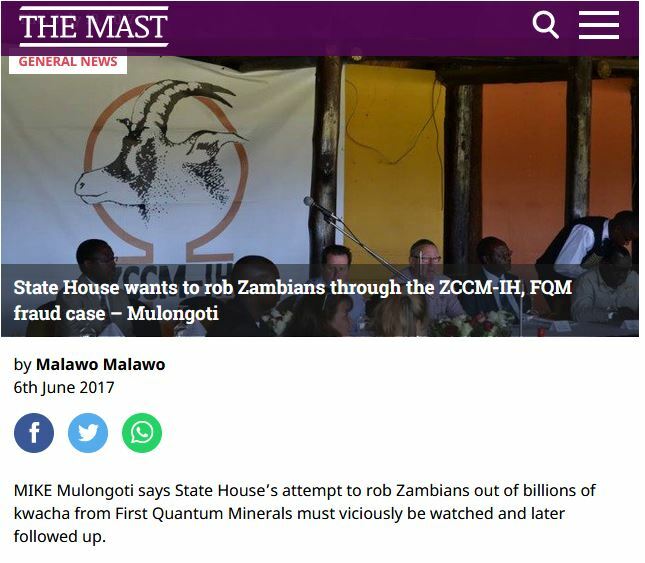 Based on the secret letter, The Mast started a violent campaign against ZCCM-FQM settlement. Zambian Watchdog is one of the most aggressive media outlets in Zambia. After the 2016 presidential election, Zambian Watchdog incited opposition supporters to violence and tribal secession. The online publication is financed by Rajan Mahtani, former Chairman of the Finance Bank, and part of M’membe’s Cartel. 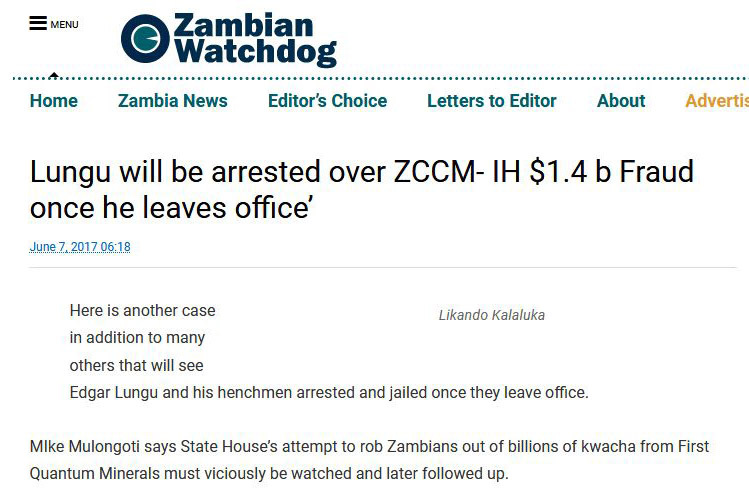 Less than a year ago Zambian Watchdog was presenting its readers Chishimba Kambwili as a man who “has pornstar daughter” who “enjoys father’s stolen money while posing naked”. 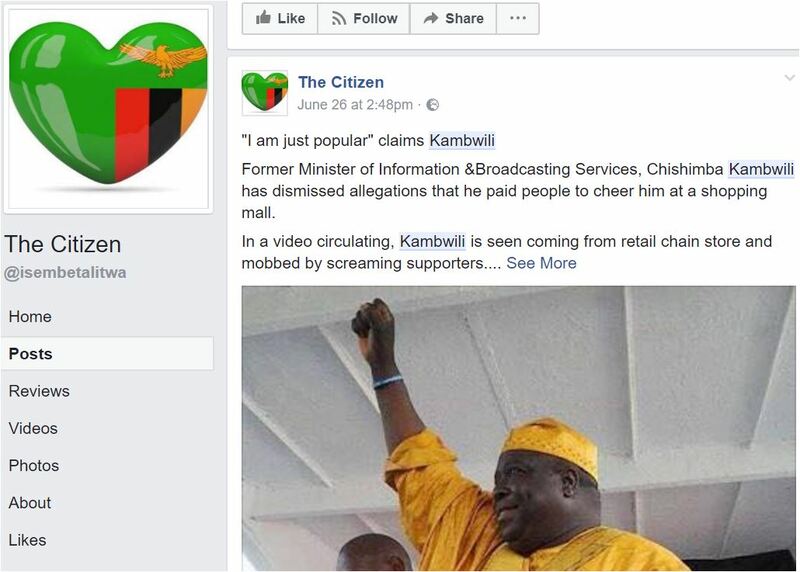 Nowadays, Zambian Watchdog is one of Chishimba Kambwili’s media platforms, presenting him as the victim of “persecution”, promoting his anti-business actions and commending PF for not taking any disciplinary action against Kambwili “despite Lungu’s wish”. 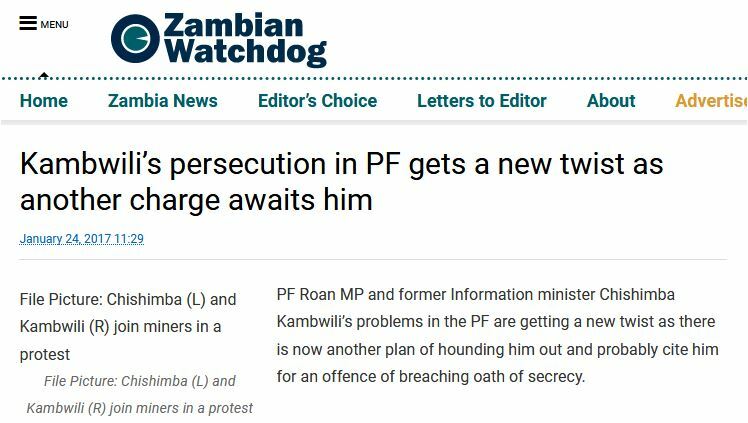 Zambian Watchdog is also part in the anti-settlement campaign fuelled by Chishimba Kambwili. 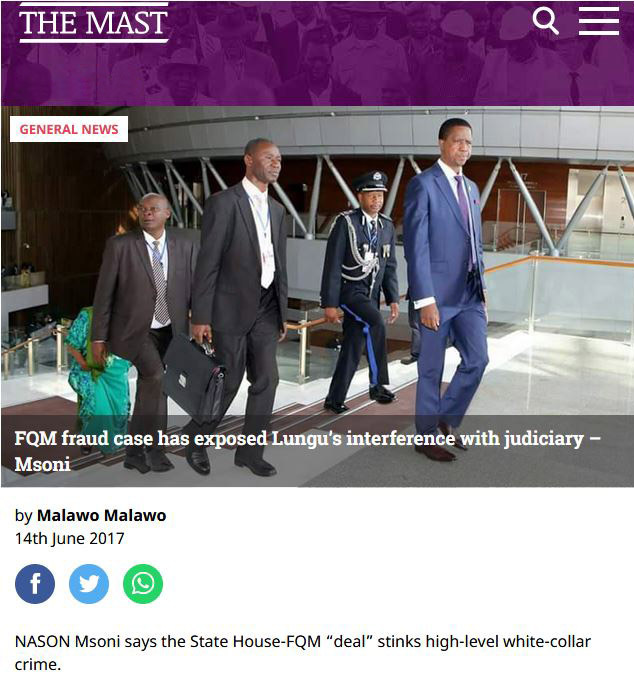 Zambian Intelligence News is another opposition publication connected to Rajan Mahtani. 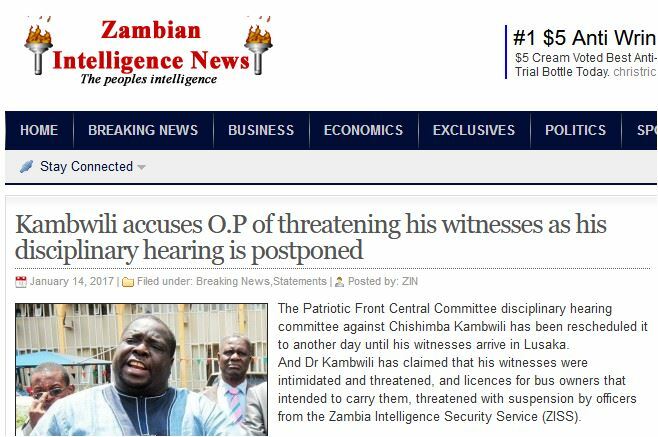 And like all other media outlets controlled by the Cartel, Zambian Intelligence News supports Kambwili. 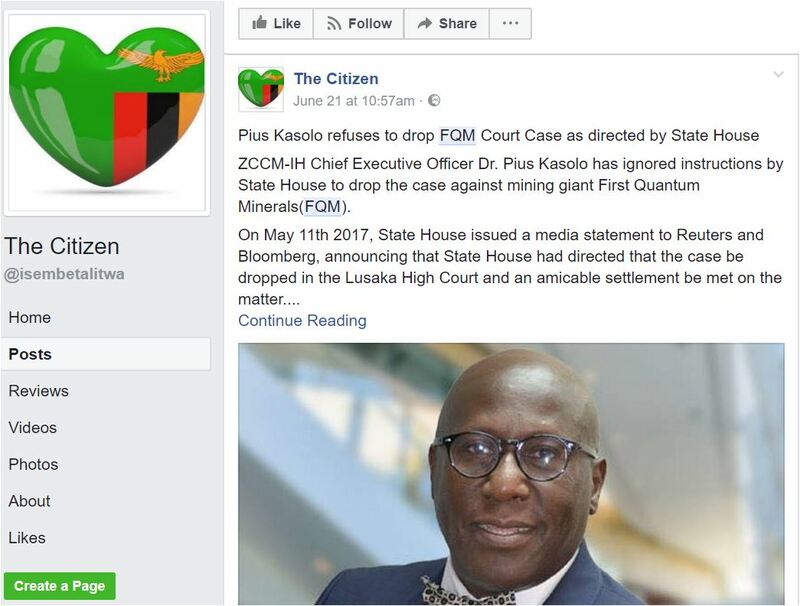 On 21 June 2017, a Facebook posting from Zambian Intelligence News provided details of the discussions between FQM and ZCCM, attacking President Lungu’s call for an out-of-court settlement. 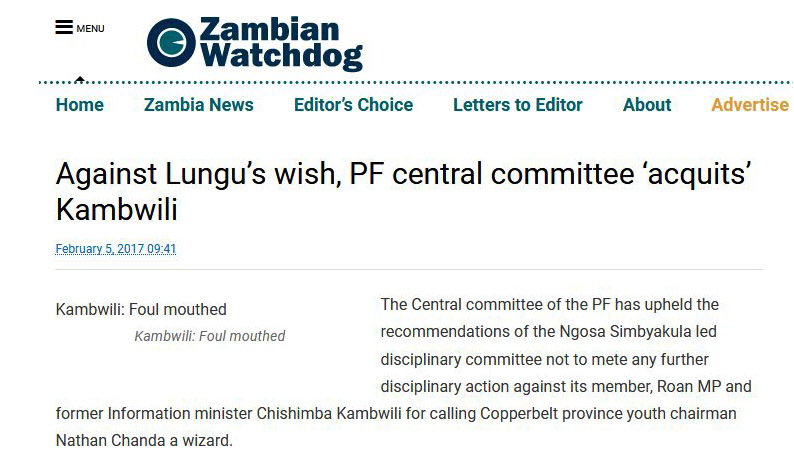 The article was based on exactly the same letter that had been delivered to the Mast by Chishimba Kambwili’s relative. On the same day, at the same time, the same article appeared in The Citizen. 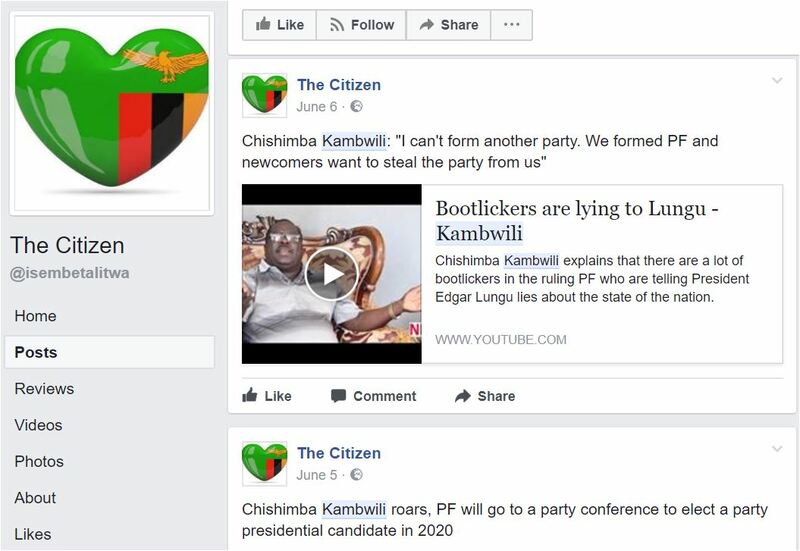 The Citizen is an online opposition outlet funded by business associates of the opposition leader Hakainde Hichilema. 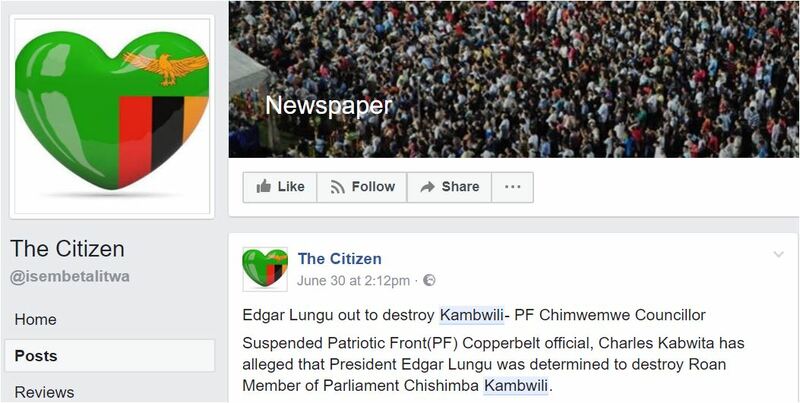 Recently, The Citizen has embarked in an open pro-Kambwili campaign, accusing Edgar Lungu of planning “to destroy Kambwili”, and promoting Kambwili’s attacks on PF leaders and his plan to block Lungu’s candidacy in the 2021 election.